having a steady source of travel funds...aka a job. my two legs for taking me places; they tire and complain but it's mostly the footwear's fault. maps and strangers who helped me find my way when I lost my sense of direction. pig out sessions with Babe for Food and Baktin Corporation. Babe for Food for picking me as her sidekick to Lubu Filipino and Seafood Cuisine, Isla Sugbo Seafood City, Kuya J Restaurant, and 10 Dove Street. free adventures in gastronomy and otherwise at Canso X, J Park Island Resort and Waterpark Cebu, Brique, Texas Creamery, Planet Grapes, and Cebu Cardinal Bakeshop. Anang Balay Turista for dumping us in El Nido...and throwing us into Jhanna's Inn which turned out to be a better place to stay in. being in awe of some of my country's gems like Snake Island, Tinago Falls, Limunsudan Falls. the persons who took charge of the El Nido and Batangas trips. All I had to do was show up with my pocket money. the people behind WAT 3.0 for letting me chase waterfalls with them. Iligan Bloggers Society, the 4th Mechanized Infantry Battalion of Iligan, all the WAT 3.0 sponsors, and the Higaonon Tribe for the unforgettable trip to Limunsudan. Neil of Rizal Memorial Library and Museum for his enthusiasm and for answering all our questions, including stupid ones. Ka Bino for the funny impromptu stint from SM City Cebu to J Park Island Resort and Waterpark Cebu. the lady in Seokguram Grotto in Gyeongju, South Korea for patiently explaining to two little Filipinos the significance of the grotto. wrong ice cream flavor choices of friends at Bohol Bee Farm...I got to finish their ice cream! Thank you also to my bottomless pit! Fred of The Exaggerated Zeal and Zhequia of FTW! Food, Travel & Whatevs for contributing to my Business Name collection. Mr Teban for saving this stranger from melting under the scorching sun by letting this stranger hitch a ride. Chang of Klick–Klock Homestay for inadvertently leading us to a gastronomic treasure hunt around Melaka by telling us about the must–not–miss eats. a never–give–up attitude during the Melaka gastronomic treasure hunt—we found Tanjung Mee Goreng! my pants not falling to my knees when we raced through NAIA 3 to catch our plane to Taipei. Taiwan travel buddy who couldn't live without getting connected...her smartphone and data plan became our savior when we weren't too smart to find our way in Taipei. the kind Korean manager of Fun Taipei Backpackers for letting us kill time at the hostel, letting us use the shower and toilet at the dorm, and helping us get a cab. finding the cookset that got stolen by a dog in the nighttime when we were camping in Burot Beach. Taal town's travel–back–in–time feel, thanks to their effort in preserving old, beautiful, historical houses. the muscle power of two friends who dragged a sack of rice (aka Mustachio) over boulders in Buhisan. the person who answered my AirAsia facebook message for changing my ticket back to the original route when their phone customer service agent would not do a thing. the ability to laugh at myself especially during stupid times. magical communication skills even without having a common language. the man who was on smoke break who took the time to search for the address on his mobile map when we we could not find the airbnb house that we booked. hope in the form of free WiFi on the street when we were about to give up looking for the airbnb house. GaEun for telling me about the KTX to Gyeongju—switching plans from bus to train cut our travel time in half but doubled our expense. A welcome splurge nevertheless. arriving in Gyeongju Express Bus Terminal just in time to catch the bus to Busan. SangCheol for clearing his weekend to show me around his city, Busan. my Busan friends. How can I ever repay your kindness and hospitality? Ji In for paying for our subway fare. She insisted! being reunited with my favorite island. So good to be back. the two people in Malapascua who remembered my face. the Cebu Happy World Museum receptionist for the discount. everyone I crossed paths with this 2014.
and always, always, to everyone who has taken the time to read this blog. When Bruce isn't running the world, he runs this cafe. Spotted along the National Highway in Brgy Tibanga, Iligan City. 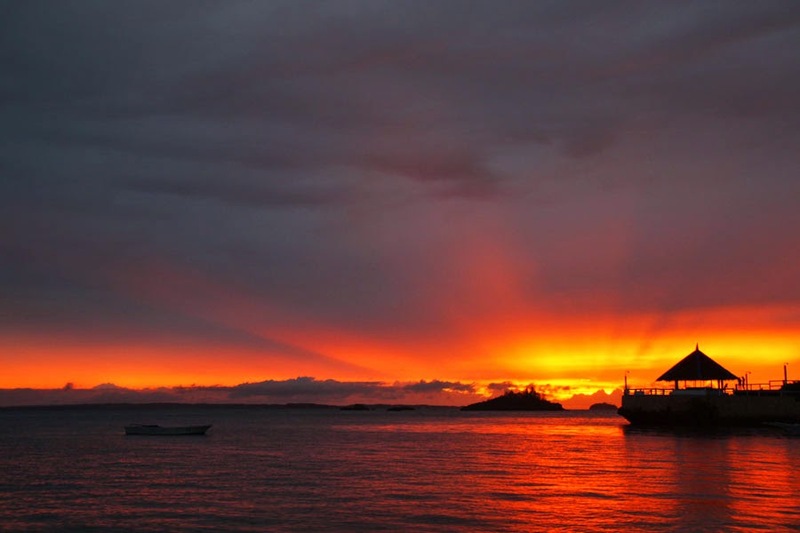 Malapascua, an unlucky Christmas for the Spaniards who, one stormy Christmas day in the 1500s, found themselves on this island. Unlucky? Pessimists! 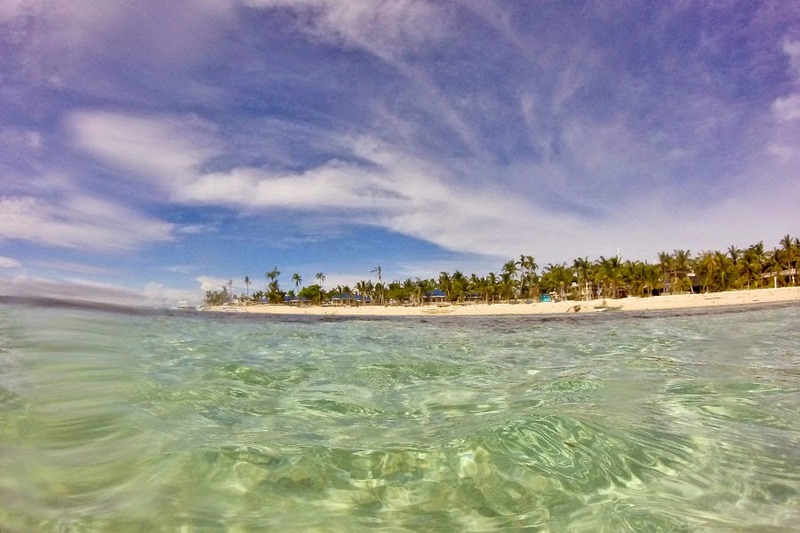 If I were them, I would have rejoiced upon finding myself on this little gem on the northern tip of Cebu! It was not until 11 years ago when I really did find myself rejoicing and laughing and rolling on the sand of this laid–back, sleepy island. Under a blanket of stars, all the island was asleep — until I broke the cool, dark, quiet night, laughing my head off at my not–so–sober sister who plunged head first on the sand when she snagged her feet on the rope that was anchoring a pumpboat to a tree. And, fueled by alcohol, laughter rang on when I fell from one end of the sunchair and rolled on the sand when the person sitting on the other end stood up. It was a long night of laughter with friends and siblings. And it was my nth birthday. Since then, I have rejoiced, laughed, explored, slept, ate, and done nothing all at the same time, in whatever weather, once a year on this island that I want to call home. Except for the past two years that I have not taken at least two days off my calendar for this island. Two days. A weekend. A weekend in Malapascua is never enough for me. But, sometimes, a weekend is all I have. And on a weekend this December, like a dog who has found its owner after being missing for too long, I wagged my mustache all the way from the North Bus Terminal to the island. No gray day or anything else suppressed my appetite. Food is always a picker–upper! 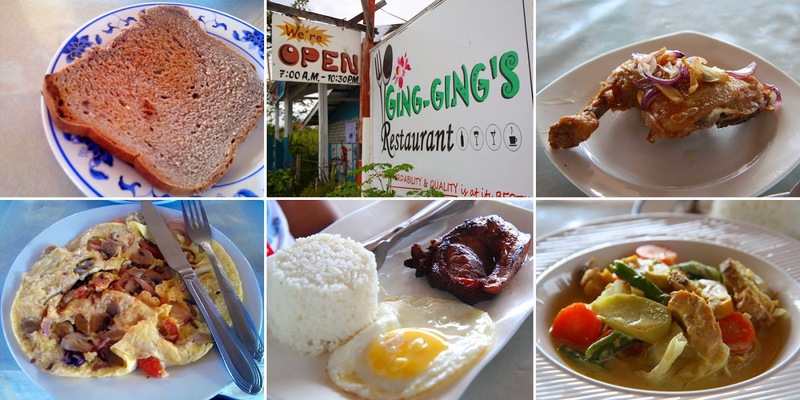 I had looked forward to eating at my favorite Malapascua Island haunts: cheap meals at Ging–Ging's and pizza at Angelina. Plus trying out a new one: Iroha Japanese Restaurant. 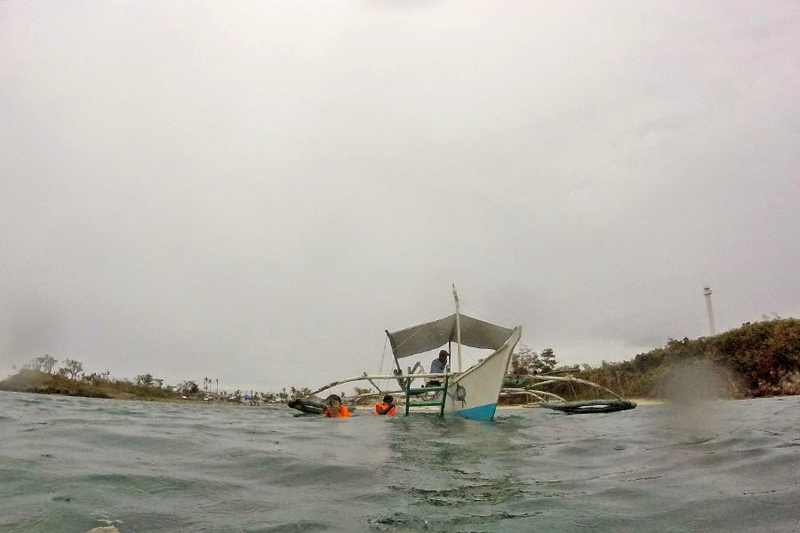 No gray skies, rain, and rough sea stopped me from flopping around in the water, looking for fish in the coral garden, Dakit–Dakit, and over the Japanese ship wreck near the island's lighthouse... except really strong current that threatened to take me away. Oh, and maybe a shark. Just kidding. There was no shark. Just very low visibility. 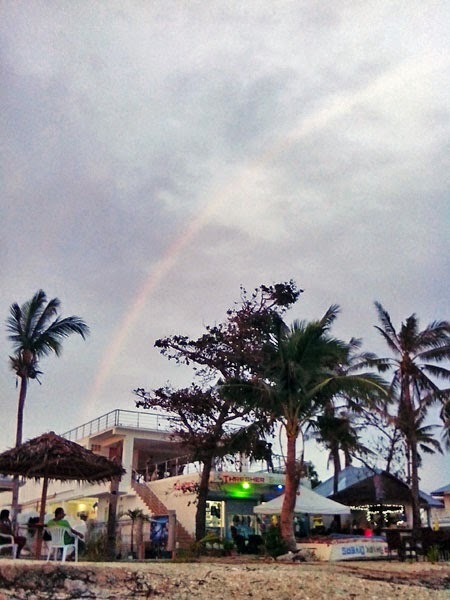 That Saturday may have been a gray day, but it ended with some color: a faint rainbow that pierced the sky just before welcoming a glorious sunset. Sunny Sunday painted the island a beautiful blue and green. It is good to be back, Malapascua. How to go to Malapascua Island: From Cebu City, go to the North Bus Terminal [(032) 346 7346] and take the Ceres bus to Maya (4 hours, Php 163, bus leaves every 30 minutes. Aircon buses at 5AM/7AM/10AM/1PM/4PM/6PM). 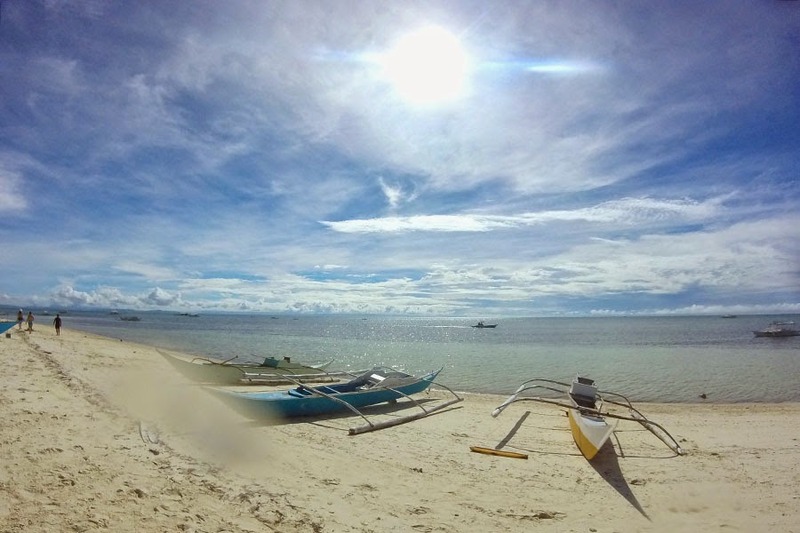 At Maya wharf, take the pumpboat to Malapascua Island (30–45 minutes, Php 80, several boat trips from 6AM to 2PM; if the tide is low, you may have to take a dinghy to the pumpboat for another Php 20; same goes when arriving in Malapascua during lowtide). 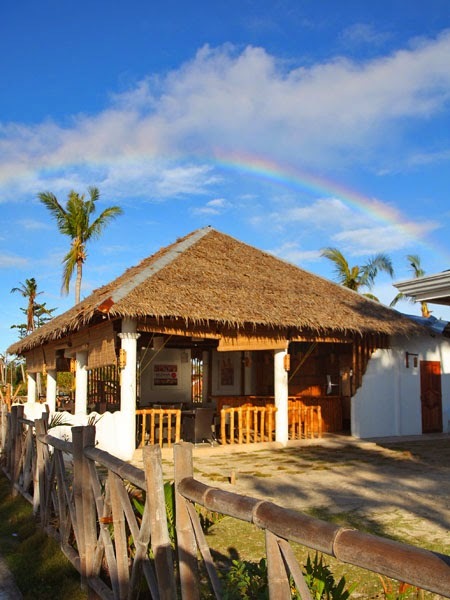 Where to stay in Malapascua Island: There are many resorts on the island. 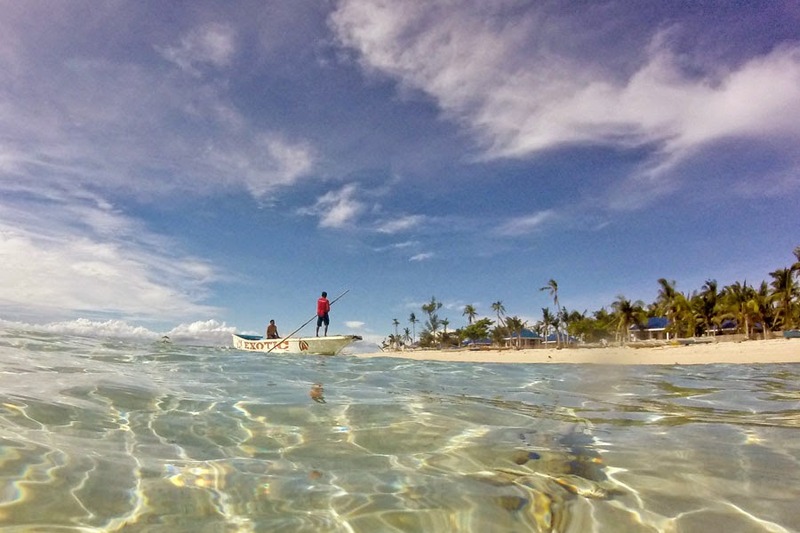 Most are on Bounty Beach, the island's main beach. Beachfront ones are the most expensive, while the cheapest ones can be found inland. There are other accommodations not on Bounty Beach, and you can find a list of accommodations in this website. K5 Rooms [0936 605 8847], see second photo in this post, is not really inland, but about 100m from shore. It is just behind Thresher Shark Divers, which is beside Blue Water. 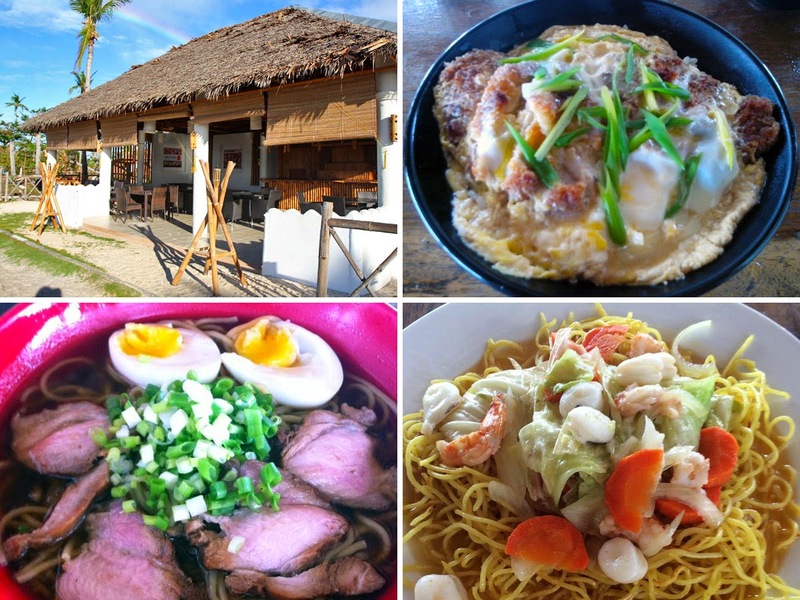 Where to eat in Malapascua Island: Some of the resorts along Bounty Beach like Cocobana, Ocean Vida, Hippocampus, Malapascua Legend, and Exotic Island Dive Resort have its own restaurant, but then food here can be expensive. I also spotted three beachfront restaurants: The Craic House, Iroha Japanese Restaurant, and Mabuhay. Other options, and my favorites are: Ging–Ging's for cheap food, and Angelina for pizza. 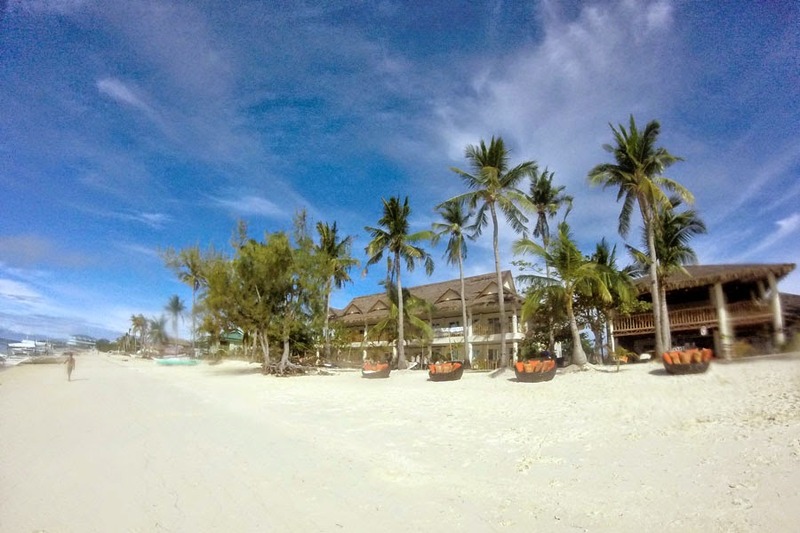 What to do in Malapascua Island: Scuba dive—Malapascua is a diver's paradise with dozens of dive spots and home to thresher sharks. Snorkel—for Php400 per person, a guide will take you to three snorkeling spots around the island: the coral gardens, Dakit–Dakit, and the Japanese shipwreck. The fee is good for three hours, and already includes a lifevest, mask, and snorkel. Explore—you can explore the island on foot or hire a motorbike or a motorbike and driver/guide, and go see the lighthouse and other beaches on the island. 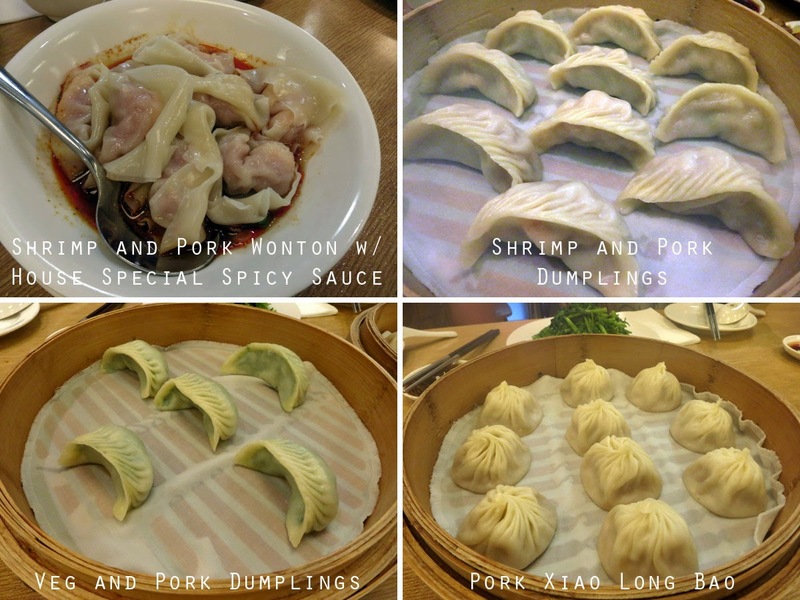 Wherever we found ourselves in Taipei, we found something good to eat. While waiting for my companion to finish her business in Chunghwa Telecom, I hung around outside the shop and found a pink poster with Chinese characters and pictures of ramen. A few minutes later, a lady planted herself across from me and started giving out flyers. She handed out a flyer to everyone who passed by but never attempted to give me one. I thought, "the place must need customers for them to be handing out flyers." I squinted my eyes and tried to see what was on those flyers. The flyers were pink and had pictures of bowls of noodles. I asked for one. A quick glance at the flyer and I immediately wanted to eat there. Why? The price was irresistible (NT$79~119, about Php120~180)...cheap compared to prices of ramen in Cebu! I convinced the group to try out the place and we found the entrance behind Chunghwa Telecom. 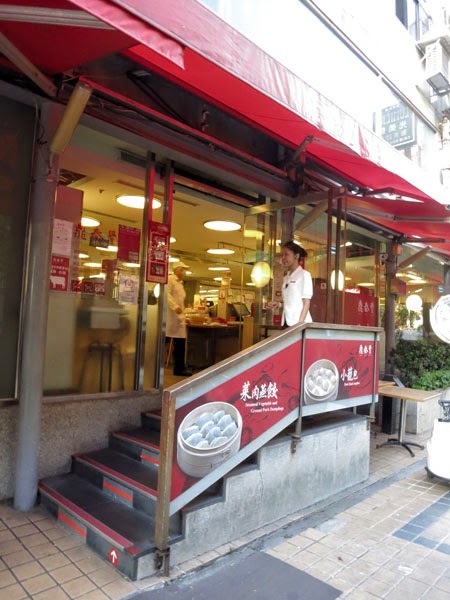 The restaurant is called Kamikawa Japan Ramen and is located right above Chunghwa Telecom. I was surprised to find the place so crowded; we had to sit in a row and share a table with a group of girls. And then remove ourselves right after eating, to give way to other hungry customers. We had the miso ramen (NT$119), tofu (NT$39), and gyudon or beef rice topping (NT$79). Kamikawa Japan Ramen's food was satisfying and generous. No wonder the place was crowded. Yentl Pasta was found on our way to Wufenpu, the wholesale garment area. 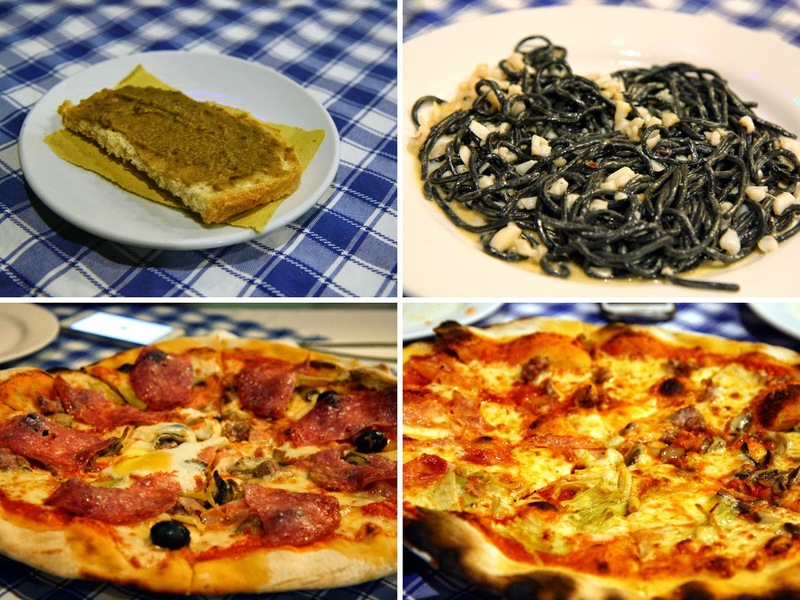 We were too hungry to look for Taiwanese food that we settled on the first restaurant we saw: Yentl Pasta, an Italian restaurant. This restaurant, like Modern Toilet, required a minimum spend (I forgot how much) per person. I am not a big pasta person, just a big (as in fat) small (as in 1–inch tall) person...I wanted anything but pasta, but everyone was too hungry and I did not want to be eaten alive and we were enjoying the air–conditioning too much (the Taiwan summer sun was just mad; never go in August!). After a visit to the Museum of Contemporary Art (MOCA) Taipei, we passed by a bakery/cafe with a dazzling display of cakes with strawberries. 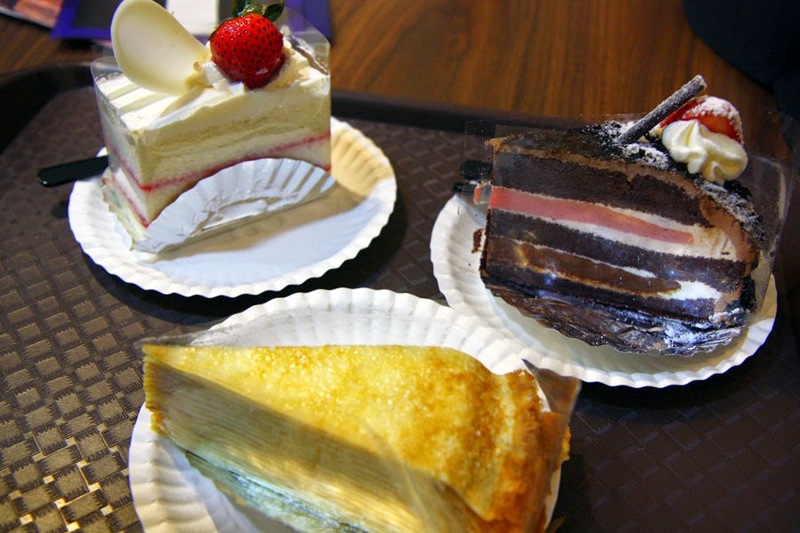 I lingered a minute or two in front of the display, then dragged everyone into Cafe 85°C and bought these cakes: strawberry (NT$40), chocolate strawberry (NT$45), and crepe cake (NT$65). Both the strawberry and chocolate strawberry cakes were delicious that I wish I had more. The crepe cake was okay—my standard for crepe cake having been set by the crepe cakes of Nadeje in Melaka, Malaysia (I haven't found crepe cakes as good as or better than Nadeje's). Our stomachs were rumbling when we arrived in Songshan Cultural and Creative Park—it was almost lunch time. The happy faces on the food trucks in the park beckoned to us, but upon closer inspection, the happy faces of the trucks revealed just snack items. We decided to go inside The Eslite Spectrum just beside the park, to find something that would resemble lunch. 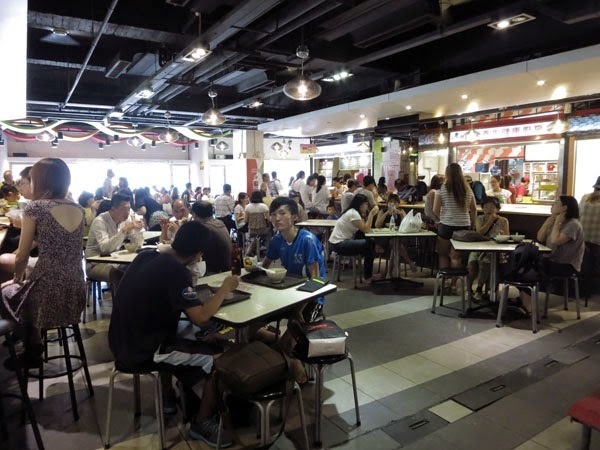 The foodcourt, on Eslite Spectrum's basement, was buzzing with people and because our stomachs were rumbling incessantly, we decided to eat at the first shop we spotted that had a vacant table. 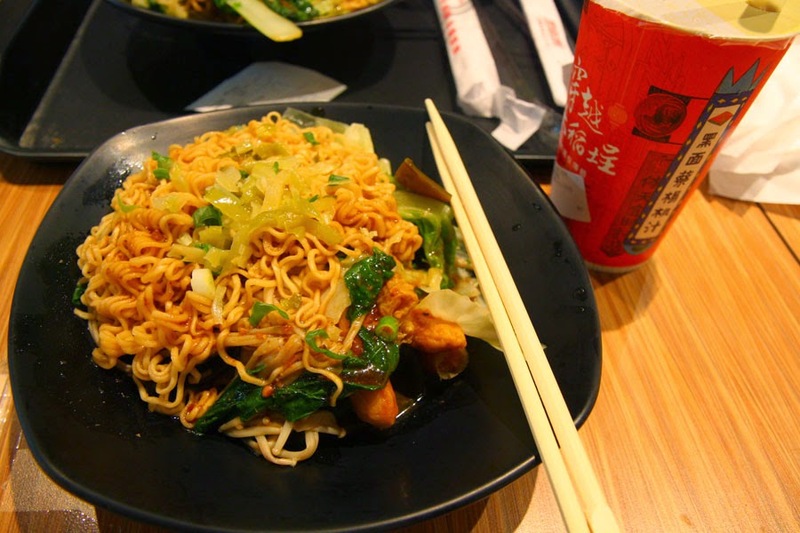 Hei Mien Tsai for lunch it was. I don't know the name of my food; the menu was in Chinese. What I do know is that the NT$110 I spent for this lunch (a set meal of noodles with veggies and sausages and a large drink) was well spent...except for the drink, which, I'm sorry to say, I chucked in the bin after two sips (it was cold bitter tea, eeyuckk). I had to squeeze between people milling about along Chengdu Road. That's when I noticed that they were queueing for milk tea. Ding, ding! 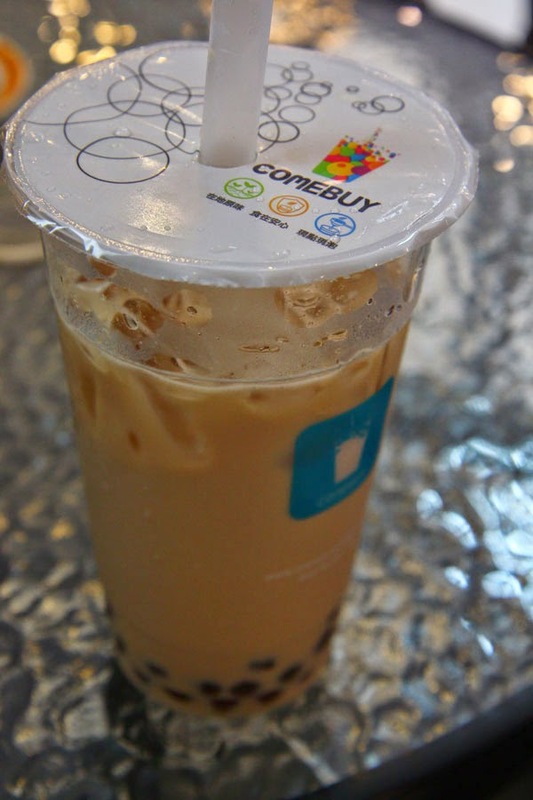 Taiwan is the home of milk tea or bubble tea. Next thought: join the crowd and buy one. There was a row of different milk tea shops along Chengdu Road and I picked the one I was nearest to: Comebuy (or maybe it was really the name that called out to me to "Come, buy!"). I tried the classic milk tea with pearls just to see if it differed in taste from the pearl milk tea that I usually get from Chatime in Cebu. Nope, tastes the same. The only difference? The price. This large cup from Comebuy cost me NT$40 (or Php60); this drink would cost Php90 in Cebu. Taipei has a number of night markets and Shilin Night Market is the largest. The market is often buzzing with people up to midnight (even on weekdays) or, in some areas where shops are still open, up to 1AM. 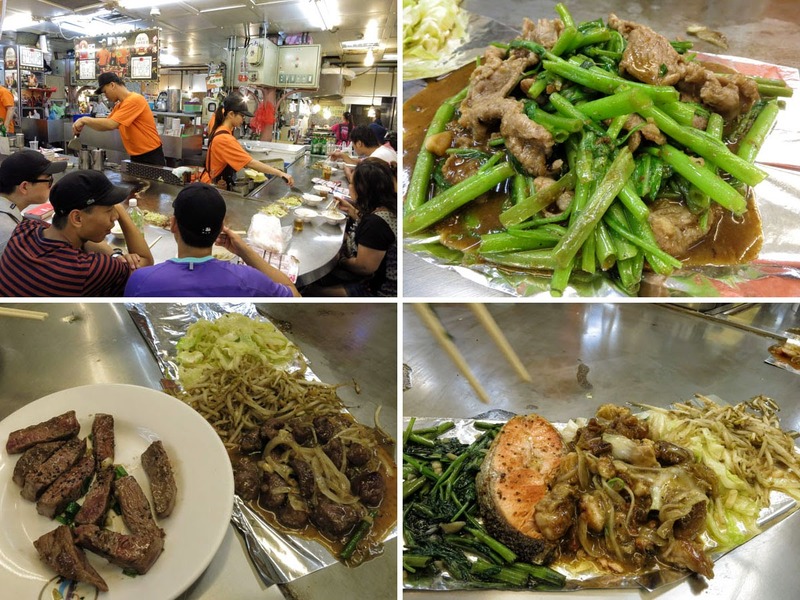 People go to Shilin Market to shop, to play, to eat. 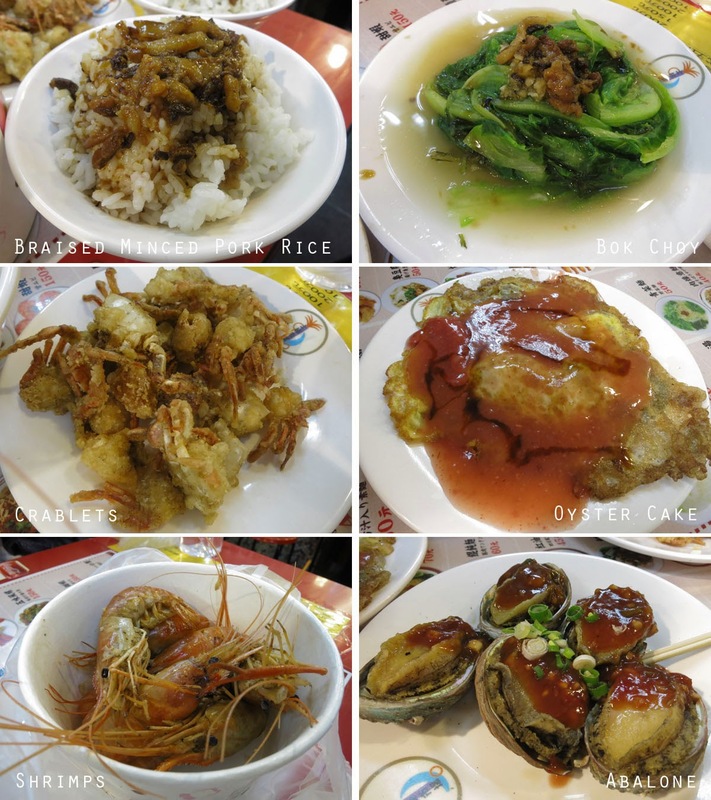 We went to Shilin Market four times. And all four times, the purpose was to eat. The walk from Jiantan Station (this is the nearest station) to Shilin Night Market is only five minutes....but ours extended up to 15 minutes with all the crowds surrounding the game stalls tugging our eyes and the smells from food carts steering our noses in different directions. ...and this food cart stopping us in our tracks with its salt and pepper cuttlefish (NT$100). Yummy yum yum. 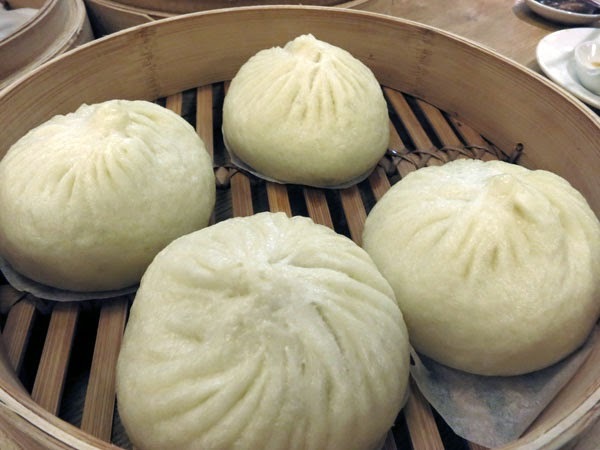 Siopao with more than just pork inside! Hot Star's large (yup, it is large! It's as big as my face!) 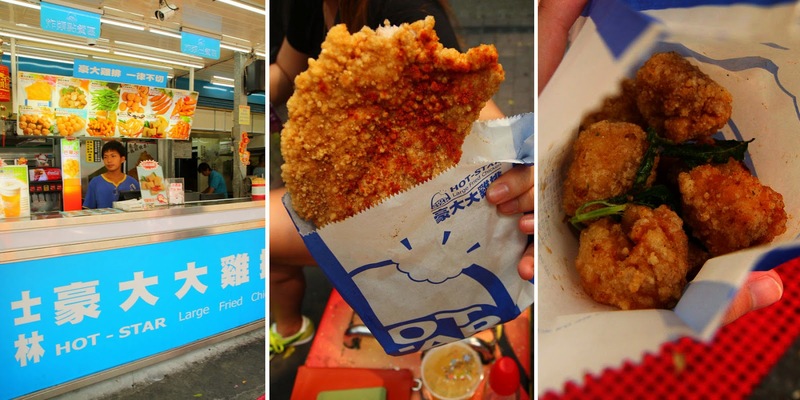 fried chicken and fried boneless chicken nuggets (NT$50 each). The photo of the stall below is of their branch in Ximending; I only saw the Hot Star stall in the foodcourt of Shilin Market on our last day in Taipei. This post crosses off just 8 of the 45 listed in that CNN article. Other items crossed off in that list during this Taiwan trip were Din Tai Fung's dumplings, the Taiwanese breakfast, and the bubble tea. I have 34 more to try and this calls for another trip to Taiwan. Directions to Shilin Night Market: Take the Tamsui–Xinyi (Red) Line to Jiantan Station, exit 1. 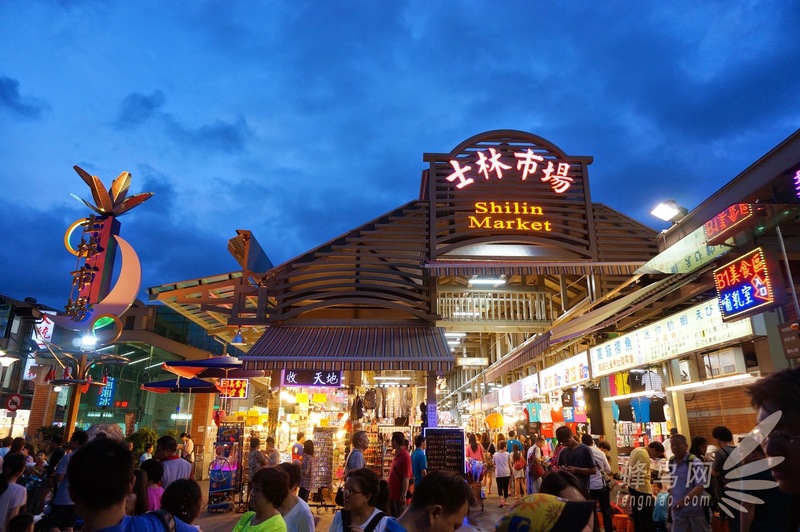 Shilin Night Market is about 5 minutes away by foot. 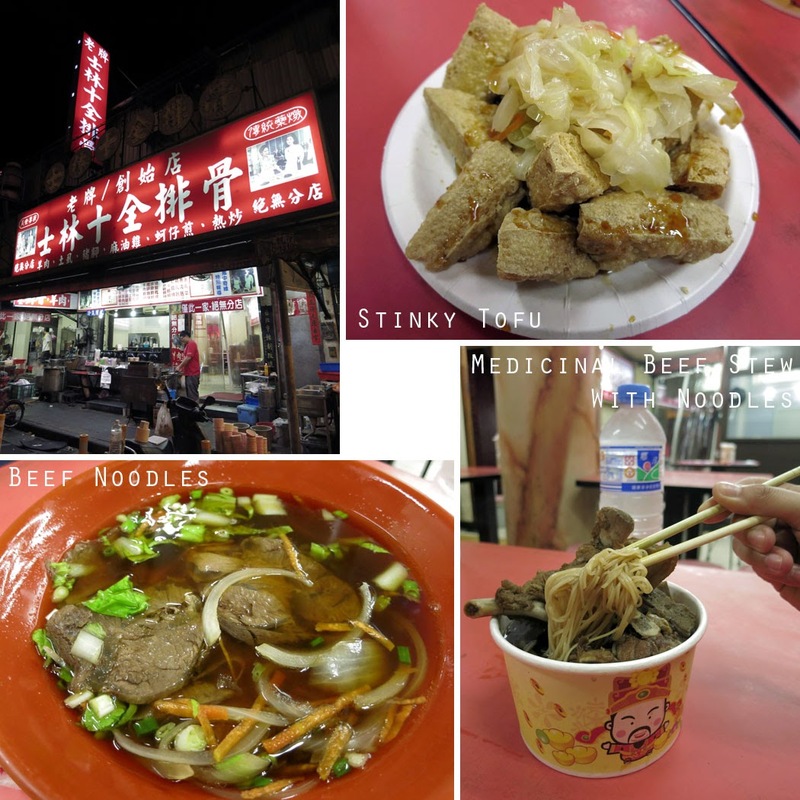 This article combined with "Tasting Taipei, Starting with Breakfast" is also featured on GPSmyCity. 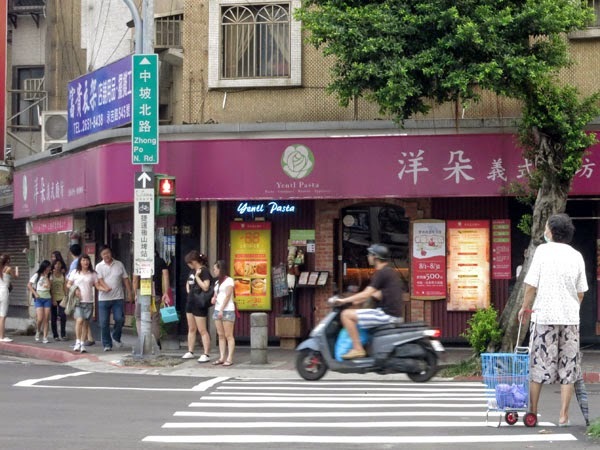 If you find this article useful and plan to use it to explore Taipei, for a minimal fee, you can download the GPSmyCity iOS app to view it offline and use the GPS-aided map. 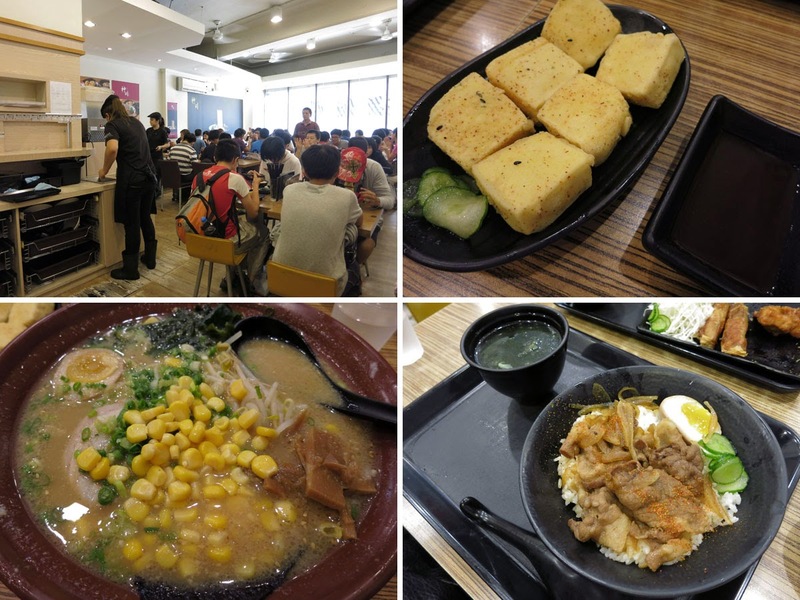 As evidenced by the bulk of my expenses, the number one priority of our Taiwan trip was FOOD! 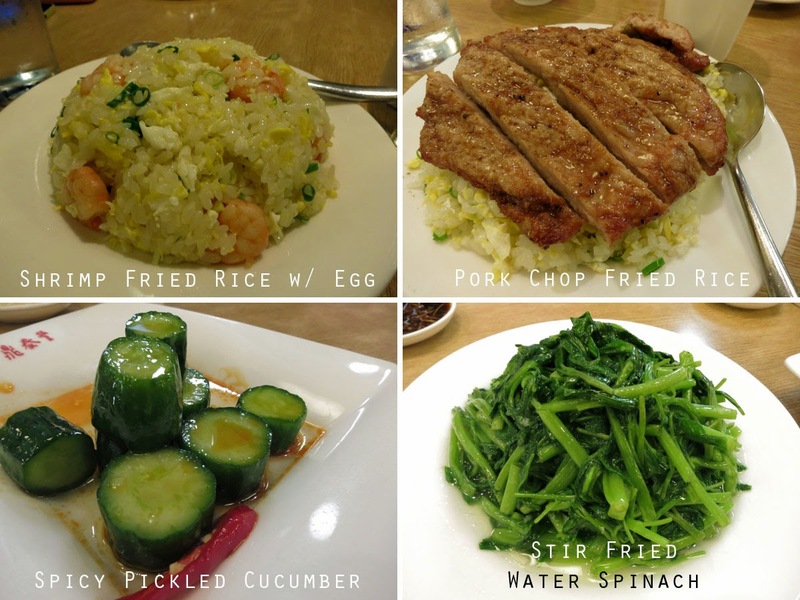 Here are two of the restaurants we went to where meals were beyond our budget of NT$200 (about Php300) per meal. 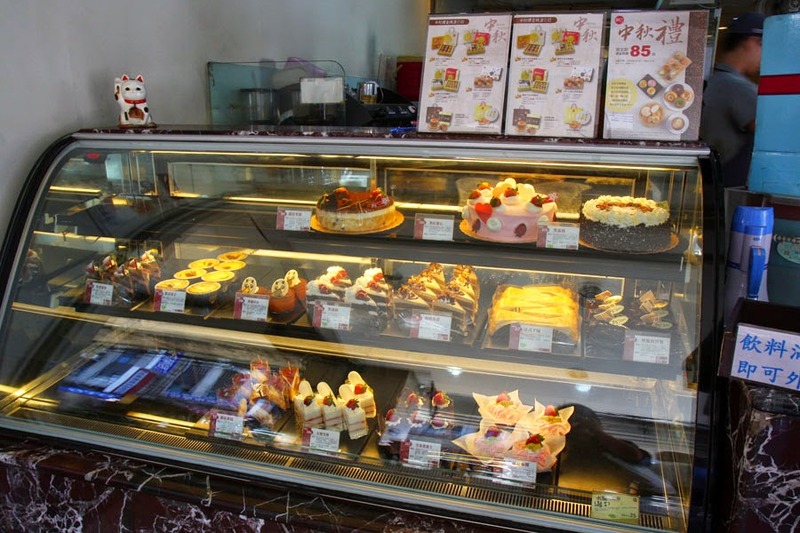 There are branches in Shilin District, Taipei City and in North District, Taichung City. Somebody told us that the food at Modern Toilet was crap. We weren't discouraged...what can you expect, it's a toilet! What she didn't tell us though was that it was going to be expensive (meals from NT$230 up to NT$380, or Php345~570; and steaks up to NT$580, about Php870). Each of us ordered a meal because we were very hungry. And because we had no choice. The menu clearly stated "Each customer is obliged to order a minimum of NT$90 or more once seated" and our butts were already on the toilet seats (aka chairs). Classic Theme Meals (NT$240~260, about Php360~390) come with rice, drink (black or green tea), and ice cream. 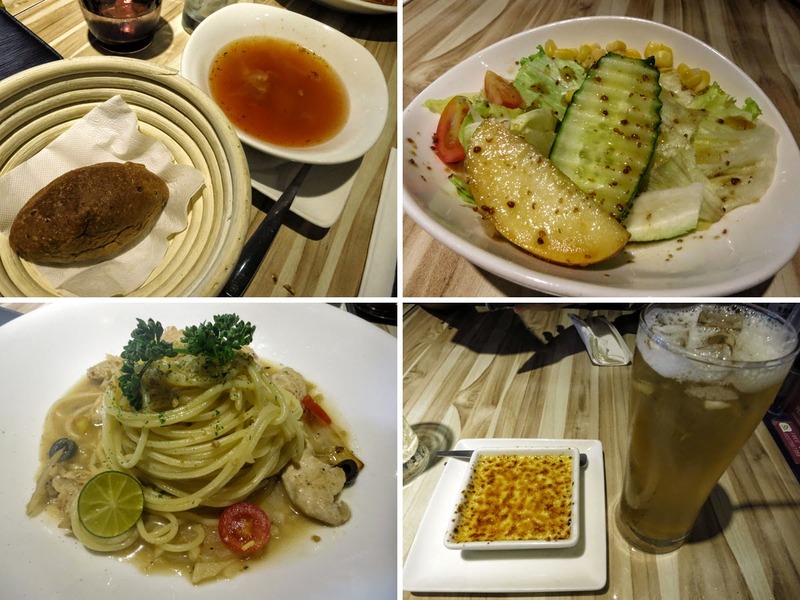 Au Gratin Meals (NT$260~270, about Php390~405) come with soup, drink (black or green tea), and ice cream. The meals were okay: the quantity can really stuff you, the taste was alright (not wow, but not bad either). 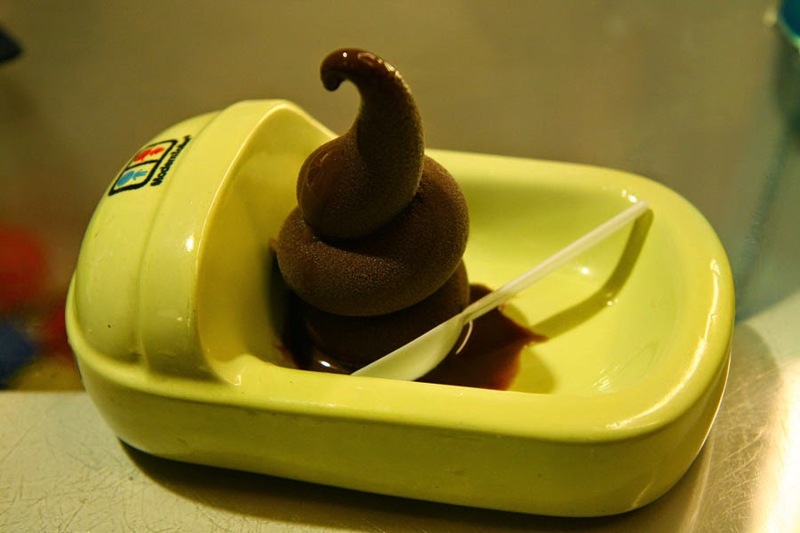 The poo–shaped ice cream did not taste like crap but it was nothing fancy either. The kiwi fruit juice (add NT$130 to the meal; NT$180 if bought separately) though was awesome (and awesomely expensive too)! The restaurant itself was colorful and unique. Bathtubs were used as tables, toilet bowls as chairs. Plates, bowls, and drinking glasses were shaped liked squat toilets, bathtubs, and urinals. The food cover was shaped like poo. But—and this is a big BUT—Modern Toilet's toilet wasn't modern...they had the squat type toilets while the typical toilet bowls were used as chairs and as a sink! Oh, the irony. 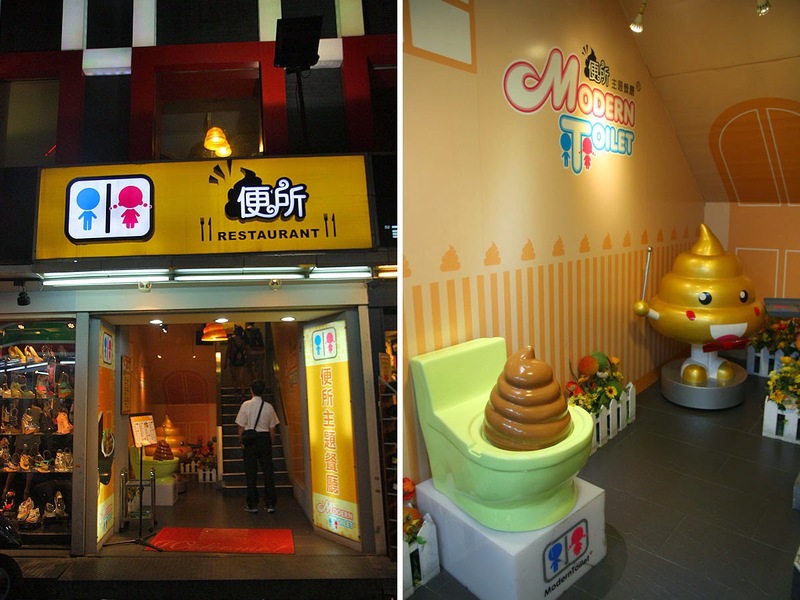 Should you eat at Modern Toilet? The food isn't worth its price, in my opinion. But if you just want to experience having a meal at a theme restaurant, then go ahead. Just be sure to make a reservation as Modern Toilet is often full. If eating an expensive meal while sitting on a toilet bowl isn't worth your time or your money, here's a place that will be worth your time and money (and you get to sit on a proper chair). I warn you, at this place, you might be tempted to order a lot and will spend your budget for two meals for just one big meal. 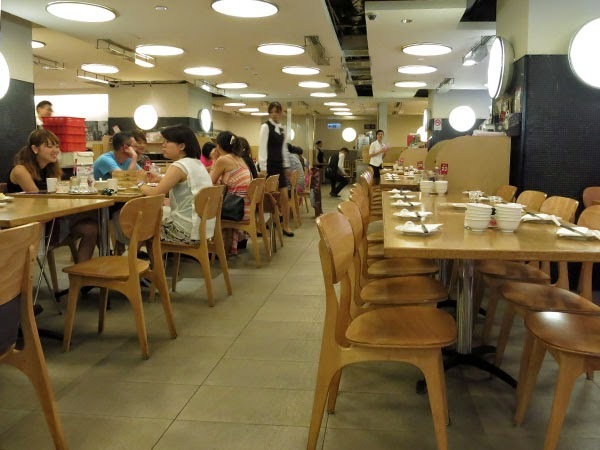 Din Tai Fung has nine branches in Taiwan and several branches around the world. Any branch of Din Tai Fung in Taipei is always full during peak meal hours. Either book a table, or line up and wait for your turn, or be like us—eat dinner at 530PM. The total bill was a whopping NT$1800 (including 10% service charge) for the four of us (I think we ordered enough to feed six); that's NT$450 (Php675) each. But, boy, it was all worth spending next day's breakfast and lunch money! Because we had not researched properly (we only took note of which Metro station to go to, and which station exit), we spent a bit of time looking around corners and up and down Zhongxiao E. Road before we finally found Fu Hang Dou Jiang on the second floor, which was the food court, of Hua Shan Market, at a quarter past noon — hey, that's lunch time! With just 15 minutes before the shop closed, the queue at Fu Hang Dou Jiang (stall #18) was still long. Half the group grabbed the next available table, and the other half lined up and craned necks to see what was on the menu (all in Chinese) and what was being bought by other customers. We saw people order a drink, some kind of soup, and bread with eggs. When it was our turn to order, we had no idea what the names of the food and drinks were and none of the servers spoke English. I looked at the tray of the person ahead of me. It had bread with something stuffed in it. I pointed to it, indicating to the server I wanted the same. For drinks, my companion said "cold". The server came back with a bowl. Thinking she had been misunderstood, my companion mimed drinking and the server took the bowl and exchanged it with plastic cup of something. Two orders of bread and drink, NT$150 (about Php225). Stall #18 is Fu Hang Dou Jiang (left). Breakfast copied from the person in front of me (right). I stabbed the plastic cover of my cup with a straw and took a sip — warm soy milk. Not bad. Next, food. I excitedly unwrapped my (okay, our, since we were sharing) breakfast and saw that inside the bread was a long piece of...another bread that looked deep fried. Boo!!! I — we — had wanted eggs inside the bread! I copied from somebody who must have been on a carbo–loading mission! On the up side, I liked the flat bread; it was crunchy on the outside, but soft on the inside, and it had bits of scallion. 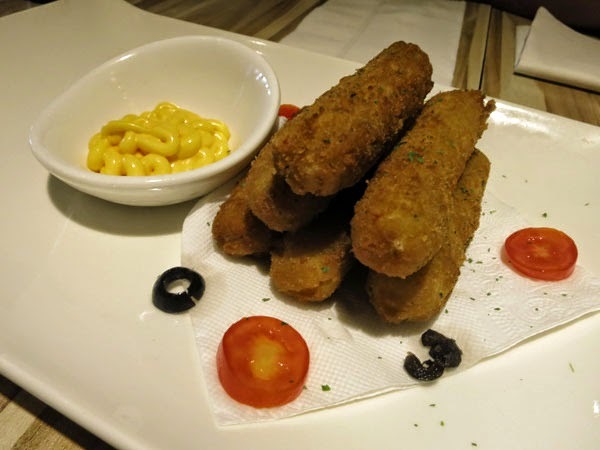 The deep fried bread stick though was meh. The flat bread and the bread stick as a very bread-y sandwich...was very heavy on the stomach. Research, after the visit, told me that 1) soy milk is called dou jiang 豆漿 (that's half of the stall's name!) and that Fu Hang Dou Jiang serves soy milk in a bowl, unless you request for it to be in a cup; 2) the bread-y breakfast we had is called shaobing youtiao 燒餅油條 — shaobing is the flat bread with scallions and youtiao is the deep fried bread stick; and 3) that shaobing youtiao paired with dou jiang is the right Taiwanese breakfast combo. Traditional Taiwanese breakfast? Check! But I still wish the person in front of me had eggs, instead of youtiao, with the shaobing. Directions to Fu Hang Dou Jiang: Take the Bannan (Blue) Line to Shandao Temple Station, exit 5. Look for Hua Shan Market, which is the building on the corner of Zhongxiao E. Rd. and Shaoxing S. Rd. ; Fu Hang Dou Jiang will be on the second floor (click map below to enlarge). If the person you are asking doesn't know, he/she will say so and apologize for not being able to help. But those who do know (even if they don't speak English) will always try to help — using hands, fingers, eyes, drawings, paper or electronic maps, or even leading the way until you get to your destination. 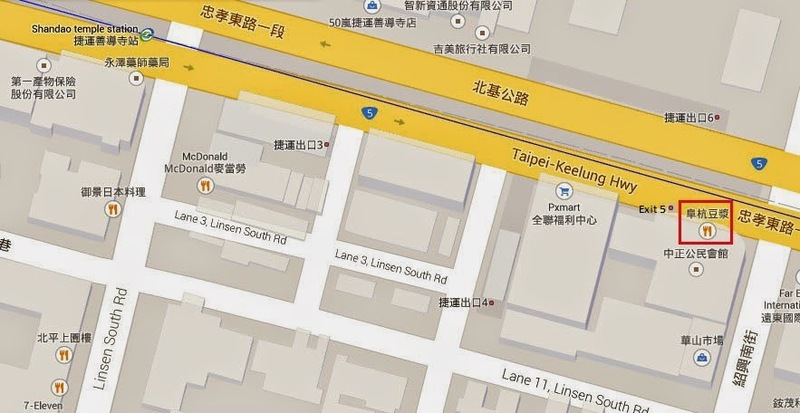 In Taiwan, upon exiting the subway I checked out the map but got disoriented anyway. I found a police station nearby and asked for help from a policeman. He didn't speak any English so he took me into the station to find someone who could. The one who could took out a printed map (I am guessing many have found their way to the station for the same purpose) and showed me where I was and how to go to Lin Family Mansion and Garden. While looking for our hostel in Seoul, we asked a guy if he was familiar with the address. He wasn't, but he took the time to search for it on his mobile (pocket WiFi is available for rent in Incheon International Airport but I didn't get one). After we had thanked him, we saw him go off to the side for a smoke—we realized he was on a break and that we had taken 10 minutes off his break time. In a subway in Seoul, my friend and I stood in front of a sign for several minutes trying to decide whether to go left or right. A kindly old stooped gentleman stopped and spoke in Korean. Seeing the question marks on our faces, he pointed to the sign, trying to get his message across. It dawned on us he was trying to help and I showed him the station map, but maybe his eyes were failing and he asked me to read it (by drawing his head near and pointing to his ear) instead. After a few minutes of my struggling with the pronunciation, he understood what I was saying and gave us directions as best he could through actions (and repeated the action–instructions thrice, to be sure). And yes, we understood him clearly.